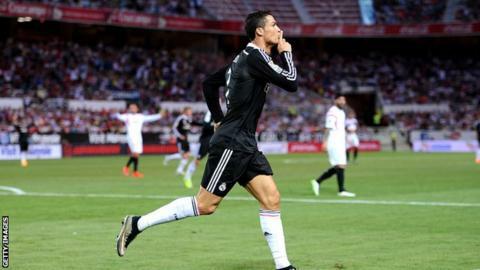 Cristiano Ronaldo's hat-trick helped Real Madrid beat Sevilla to stay in touch with La Liga leaders Barcelona. Barca's 8-0 thrashing of Cordoba earlier put pressure on Real to get a result against a Sevilla side that had not lost at home since March 2014. Ronaldo brought that 35-match unbeaten streak to an end as Real survived a few nervous moments after goals from Carlos Bacca and Vicente Iborra for Sevilla. Real are two points behind Barca with three matches of the season left. Ronaldo's sixth hat-trick of the campaign also took him past a long-standing club record of 28 hat-tricks held by Real legend Alfredo Di Stefano since 1964. The Portugal forward put Real ahead in the 36th minute when he headed in Isco's cross from six yards out. Two minutes later the 30-year-old struck again as he poked in James Rodriguez's cross from the right flank. On the stroke of half-time Real defender Sergio Ramos gave away a penalty with a needless foul, with Colombia striker Bacca drilling the spot-kick down the middle to make it 2-1. Ronaldo restored the two-goal cushion with a superb looping header into the far corner from substitute Gareth Bale's pinpoint cross, only for Sevilla to hit back again. A well-worked move allowed substitute Kevin Gameiro to find Aleix Vidal down the right who cut the ball back for Iborra to finish. Sevilla pressed for an equaliser but Carlo Ancelotti's side, who have not won the league title since 2012, held on to secure the points. Elsewhere, Real's city rivals Atletico Madrid were held to a 0-0 draw by Athletic Bilbao while Deportivo La Coruna came from behind to draw 1-1 with Villarreal. Match ends, FC Sevilla 2, Real Madrid 3. Second Half ends, FC Sevilla 2, Real Madrid 3. Corner, FC Sevilla. Conceded by Daniel Carvajal. Aleix Vidal (FC Sevilla) is shown the yellow card. Daniel Carriço (FC Sevilla) is shown the yellow card for a bad foul. Cristiano Ronaldo (Real Madrid) wins a free kick in the defensive half. Éver Banega (FC Sevilla) wins a free kick in the defensive half. Attempt saved. Vicente Iborra (FC Sevilla) left footed shot from the centre of the box is saved in the centre of the goal. Assisted by Denis Suárez with a through ball. Attempt missed. Vicente Iborra (FC Sevilla) header from the centre of the box misses to the right. Assisted by Reyes. Reyes (FC Sevilla) wins a free kick in the defensive half. Offside, Real Madrid. James Rodríguez tries a through ball, but Gareth Bale is caught offside. Substitution, Real Madrid. Álvaro Arbeloa replaces Marcelo. Benoît Trémoulinas (FC Sevilla) is shown the yellow card for a bad foul. James Rodríguez (Real Madrid) wins a free kick on the right wing. Foul by Benoît Trémoulinas (FC Sevilla). Corner, FC Sevilla. Conceded by Pepe. Attempt blocked. Denis Suárez (FC Sevilla) left footed shot from very close range is blocked. Attempt saved. Kevin Gameiro (FC Sevilla) right footed shot from the right side of the six yard box is saved in the bottom right corner. Attempt saved. Toni Kroos (Real Madrid) right footed shot from outside the box is saved in the bottom right corner. Assisted by James Rodríguez. Dangerous play by Gareth Bale (Real Madrid). Daniel Carriço (FC Sevilla) wins a free kick in the defensive half. Offside, Real Madrid. Pepe tries a through ball, but Cristiano Ronaldo is caught offside. Goal! FC Sevilla 2, Real Madrid 3. Vicente Iborra (FC Sevilla) right footed shot from the centre of the box to the centre of the goal. Assisted by Aleix Vidal. Substitution, FC Sevilla. Vicente Iborra replaces Grzegorz Krychowiak. Delay in match Sergio Ramos (Real Madrid) because of an injury. Attempt missed. Toni Kroos (Real Madrid) right footed shot from outside the box is too high. Assisted by Marcelo. Attempt blocked. Denis Suárez (FC Sevilla) right footed shot from outside the box is blocked. Assisted by Éver Banega. Substitution, FC Sevilla. Denis Suárez replaces Diogo Figueiras. Goal! FC Sevilla 1, Real Madrid 3. Cristiano Ronaldo (Real Madrid) header from a difficult angle on the left to the bottom right corner. Assisted by Gareth Bale with a cross.